At 7:30 the room grew quiet, and the small throng of geeks migrated into the "Kanbar Forum" room — a small auditorium with a large presentation screen — for the official unveiling. Someone told me even Randal L. Schwartz was in the room. There was already a browser on the screen that was displaying the Perl6 home page at Perl6.org, and two more tabs appeared to be IRC logs "for #p..." The quiet chatter turned to applause when Larry Wall finally walked out onto the stage. Then he made shadow puppets on the screen with his fingers — and left. "I have to say, these language designers can be such a tease sometimes," joked Jeremy Zawondy from Craigslist. He'd come up to the podium to officially introduce Larry before the main presentation. Jeremy noted the parallel development of Perl 5 and Perl 6, arguing that it really says something about the Perl community. And then he shared how people had answered his question when RSVPing for the event on Meetup. "What do you love about Perl?" "I've been using it forever. It's part of my brain." "Because it's so wrong." (Applause) Jeremy turned to the audience and said, "So far I agree with all of these." "It dares to be weird. "It makes me feel happy." "And last, but not least: 'It's readable'." (Laughter from audience...) But Jeremy said he'd been talking to Larry and his wife about the old joke comparing Perl code to line noise. And he noted that later, languages started copying Perl's built-in support for regular expressions. "They made fun of Perl, but..." Then he said something about "years to come" — I'm not sure if he was talking about Larry or Perl — and then finally Larry Wall came back onto the stage. He removed his leather cowboy hat, smiled, and then playfully handed the hat to his wife. One of the first things he said was a thank-you to Craigslist, "for sponsoring me these last few years." 61-year-old Larry Wall said he couldn't properly express his gratitude to Craigslist. And then he launched into his first series of slides. My favorite slide said "More bugs. Less docs." ("Wait, that's a bug," Larry joked, quickly replacing it with a slide that said "More docs, less bugs.") For example, he described one of Perl's earlier problems as "Hanging things on the wrong peg." (That is, too many things being accessible in the "global" namespace, which Larry proved by displaying the keys from a hash of global environment variables.) Then he ran the same code on Perl 6, which found no variables in the global namespace. A lot of them went instead into the CORE library. "They're hung on the right peg," Larry said, "instead of the wrong peg..."
He seemed pleased to be upgrading a language that he'd first shared with the world more than 28 years ago. 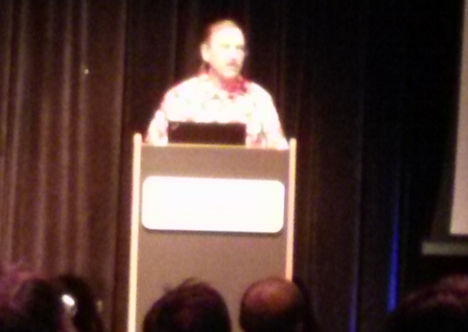 He pointed out that Perl 6 would have fewer arbitrary lists for geeks to memorize. (Like which symbols are global, but also which functions use the special $_ variable as their default parameter). And Larry demonstrated a Perl 6 program which, among other things, made use of the trendy new "enumerated" type. The program simulated a forest fire using tree icons in one of four states. Amazingly, all the little tree icons were continuously being re-drawn surprisingly quickly on his screen, each one using different ANSI colors to simulate their current state. Larry explained that this was being facilitated by the tree object's "direct-access variables", created by adding a "bang" after the variable-type sigil. "By the way, strict is default," he said, drawing enthusiastic applause from the audience. The strict pragma stops the troublesome auto-creation of new variables when a variable name is accidentally mistyped — which has plagued Perl developers for years. He also said something about improving the scoping of methods by looking up the call stack (noting Perl's infamous attempt at a local function back in the 1990s). There was a nod to other quirks of Perl 5 — "multi-pass parsing" and various examples of "action at a distance" — showing that he'd really dug down into the "guts" of Perl. He had a funny response when someone asked about his philosophy about what should be included in the standard library. First he replied that Perl 6 is analogous to the Linux kernel, in the sense that nobody only downloads it by itself. ("They download a distribution.") So unlike some other programming languages, these "editorial decisions" about what should be included are delegated to the creators of those distributions. "In other words...we punt." He seemed excited that universities would now have a single language that could be used to teach every style of programming — from functional to procedural. With an eye toward the future, he said "Some professors will think that's a great thing." And this came up again after a very thoughtful observation about the new butterfly logo for Perl 6. "Paul Graham wrote this thing about the 100-year language," Larry remembered, which had inspired some thoughts about language longevity. So the new butterfly logo for Perl 6 "is specifically designed, among other things, to appeal to 7-year-old girls. The Python community has done a much better job appealing to kids with fun stuff. "We don't expect to be the language of the week. We don't want to play that game. We want it to keep being there... We don't want their language to run out of steam. It might be a 30- or 40-year language. I think it's good enough." And then someone in the audience asked him which part of Perl 6 was his favorite. "The part where we get done," he answered. "I kind of like all of it, really." Now I wish even more that I had been there.